Italy’s South Tyrol region is always a delight to visit for your ski holidays. The northernmost region of Italy located at the heart of the Dolomites, a UNESCO World Heritage Site, manages to offer 300 sunny days per year despite its snowy reputation (there’s a Snow Guarantee in place from December to April). 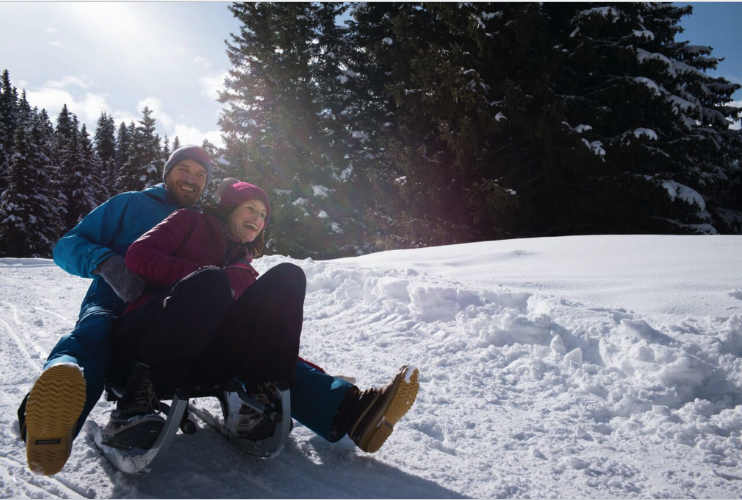 That climate of sunshine and snow underlines the mix of Alpine-Mediterranean culture, food and wine that gives your holiday a feeling of pure fun, relation and freedom here, making it an ideal destination for family holidays. 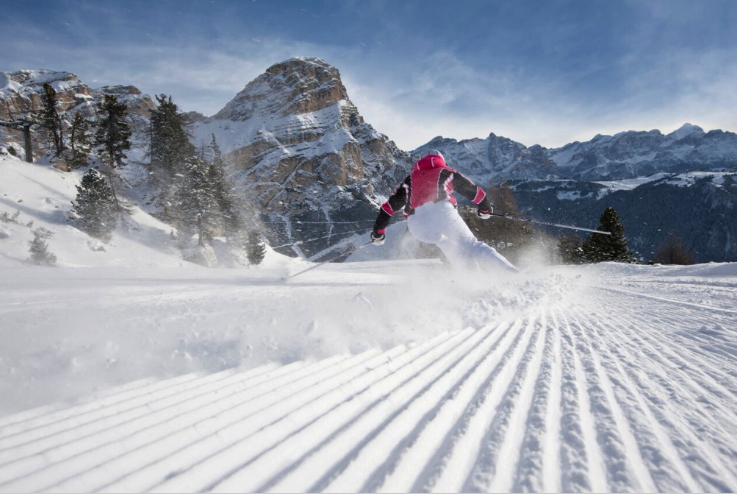 South Tyrol is home to the world famous Dolomiti Superski region, one of the world’s biggest ski areas with 1200km of downhill ski runs divided in to twelve valleys, each with a selection of villages in which to stay. There are hundreds of kilometres of prepared cross country ski tracks too. Many of the valleys have ski lifts and pistes connecting them to their neighbours, with the most famous link the remarkable Sella Ronda, a circular route with 26km of runs and individual valleys (Val Gardena/ Gröden, Fassa, Livinallongo and Badia / Gadertal) radiating off to create one of the world’s biggest lift-linked ski regions, as well as being a wonderful day trip on its own. The vast ski region means there’s terrain for every ability level with no less than 63 ski schools on hand for children, beginners and anyone wanting to improve their technique. All of the ski areas in South Tyrol are very family-friendly but the resorts in Three Peaks/3 Zinnen in the Dolomites are especially perfect for children, with several winter playgrounds, gigantic snowmen and ice castles at the Winter Wonder World in Sesto/ Sexten. The whole huge area is just endless pleasure for recreational intermediate level skiers and boarders. There are hundreds of wide, smooth cruising pistes, the longest, La Longia, at Seceda a wonderful 10.5km descent to the village of Ortisei/ St. Ulrich in Val Gardena. For advanced skiers guides can take you to some of the world’s best off piste terrain and for groomed runs the World Cup-worthy slopes, Saslong and Gran Risa test the best, with thrilling vertical drops of over 400m and maximum inclines crossing 50%. During the day on your skis you have the chance to dine in a huge variety of mountain huts ranging from simple farmhouse inns to Michelin-star restaurants such as the Auener Hof, regarded as one of the finest Michelin-starred restaurants in Italy which serves feasts of four to twelve courses – including dishes such as praline smoked pork with truffle cream. Depending on which establishment you choose you can enjoy everything from traditional to modern cuisine, but all with the unique and characteristic style of Alpine-Mediterranean cuisine. Rural, down-to-earth tastes spiced with Mediterranean charm are the ingredients for creating distinctive flavours. This region is famous for more than just its apples, wine and smoked ham. Each dish is a diverse reflection of the location, with awarded chefs that drive the local food scene. Its distinct taste will never disappoint. Whether you’re indulging in hearty, home-made ravioli or topping off the day with a classic apple strudel, you’ll never leave without a second helping. Speck dumplings and apple strudel are South Tyrolean classics. No matter which course you are enjoying – the pleasant aperitif, a zesty antipasto, homemade pasta varieties, or an indispensable Caffè Macchiato as a finishing touch – southern culinary influences are readily apparent in the food and drinks. In terms of drinks the locals love their refreshing Hugo aperitifs (Prosecco with elderflower cordial), but you can also sip on some of Italy’s finest wines from the vineyards that dot the valley in the region. South Tyrolean wines have earned not only a good reputation but numerous awards throughout the world. From aromatic, spicy reds to white vanilla bouquets, every note will inspire your senses. Kronplatz operates the largest ski area in South Tyrol with one of the world’s most modern and advanced ski lift network of predominantly gondola and high-speed chairlifts. Perfect for the more advanced skier or snowboarder looking to challenge themselves, Kronplatz is one of the few resorts in the Alps with five black runs including the infamous 5km long Sylvester run as well as Herrnegg and Piculin which, with a gradient of 72%, is one of the steepest runs in Italy. Another of the resort’s black runs, Ërta, with a maximum slope of 61%, the giant slalom course at Pre da Peres, is where Kronplatz stages its annual FIS Alpine skiing World Cup race, coming up this season on 23rd January 2018. Altogether the five black runs have a total length of 22.5 km (14 miles) and nearly 4,000 meters (13,000 feet) of elevation change. Anyone who skis all five and sends a photo of themselves in front of specific signage on every run to [email protected] will receive exclusive Kronplatz gadgets sent to them free of charge! 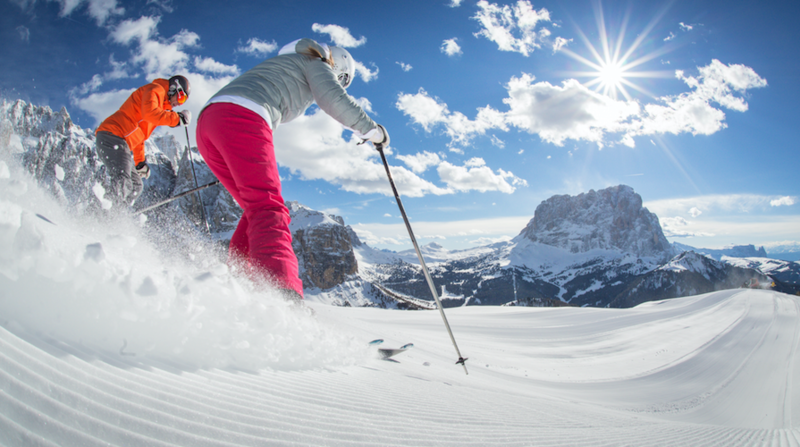 Alta Badia is one of the biggest and best ski areas in the Dolomites, located on the Sella Ronda circuit with terrain for all. Is global stature is such that it is another annual World Cup racing venue. 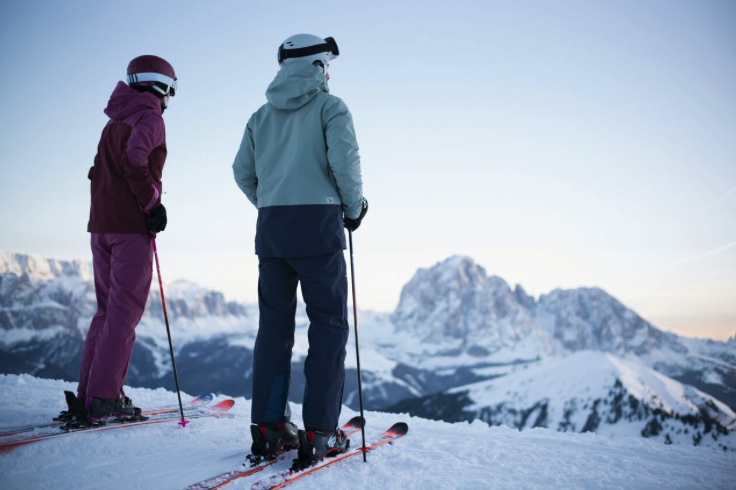 Every year in December, the world of skiing looks to South Tyrol and Alta Badia. With a vertical drop of 448 m (1469ft) on a 1255 m (4117ft) length and a maximum slope of 53%, the Gran Risa slope in La Villa is considered as one of the most beautiful slopes in the Ski World Cup. This season’s race take place on 17th and 18th December 2017. But Alta Badia has an added reputation as a destination for skiing foodies. In the valley alone there are three Michelin stars, giving you an idea of just how fantastic the food in this region is. 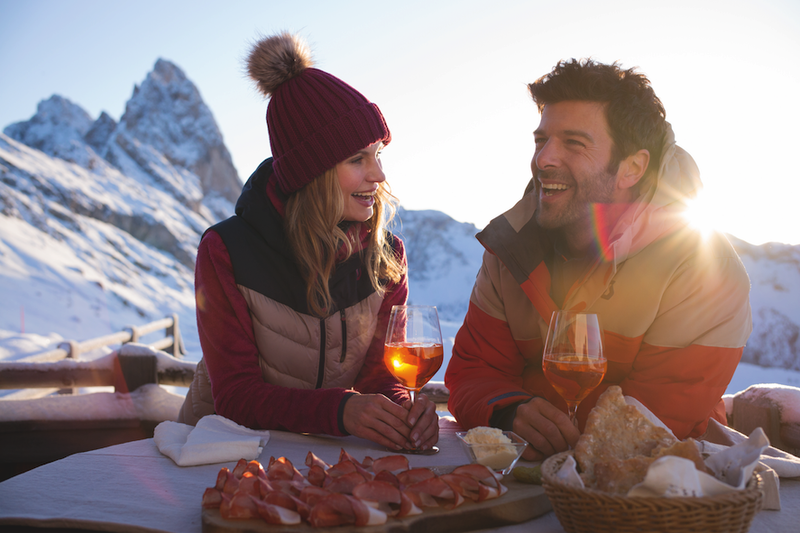 The resort’s ‘A Taste for Skiing’ programme offers a series of events uniting the favourite sport of the Dolomites with the finest chefs; ski from hut to hut sampling Michelin-starred cuisine with perfectly paired South Tyrolean wines. It’s one of several culinary themed opportunities running throughout the season and allowing all tastes and budgets to enjoy great food without needing to book in to a gourmet restaurant per se. 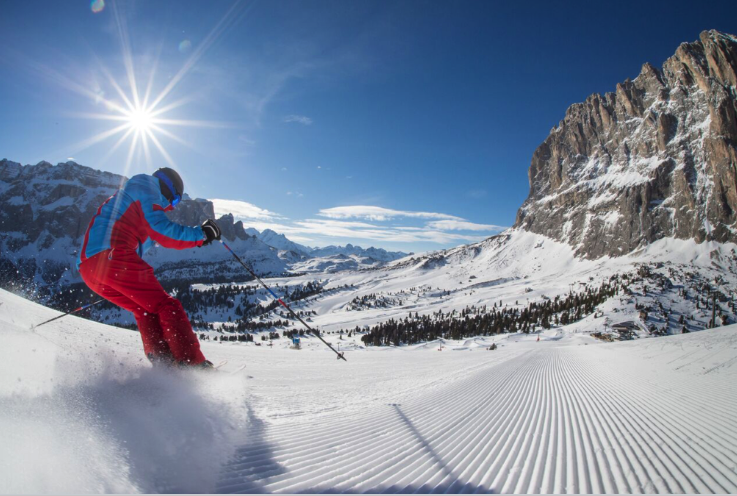 Val Gardena has long been one of Italy’s best known destinations worldwide, a fixture on the world Cup racing circuit for decades, a beautiful valley and a part of the famous Sellaronda circuit. This winter a new gondola “Piz Seteur” boasting a stylish Pininfarina design and roomy 10 seater cabins will go in to operation in Val Gardena making getting around the slopes even quicker and more relaxed. But before (and during) the big race weekend Val Gardena is a great choice for experiencing the magic of Christmas as the resort creates its own special attractions in each of its main villages. There’s a Christmas village from 1st December to 6th January in Ortisei where you can listen to Christmas carols, be guided to the doors of bakeries and stalls by the sweet smell of Christmas cookies wafting through the village, kneel and ever so lightly touch the wood carved nativity scene figures, gaze in wonder at the advent decorations peppering the village and the landscape covered in snow. Meanwhile the original Val Gardena Christmas Market runs from 1st to 30th December in Santa Cristina/ Sankt Christina where the range of goods on offer includes typical products like wood-carved cribs, angels, toys, books, candles, ceramic, honey, Christmas biscuits and mulled wine. There’s also the “Mountain Christmas” organised from the 7th December to the 7th of January in Selva/ Wolkenstein. This Christmas in Selva, an old fashioned cable car of miniature wooden cabins, shining with fairy lights, can be found hanging above a magical Christmas village. A typical mountain hamlet will be brought to life with traditional huts of stone and rustic wood, like those of times gone by. In addition to the World Cup Races and gourmet events already mentioned, The South Tyrol has lots of special events staged through the winter. 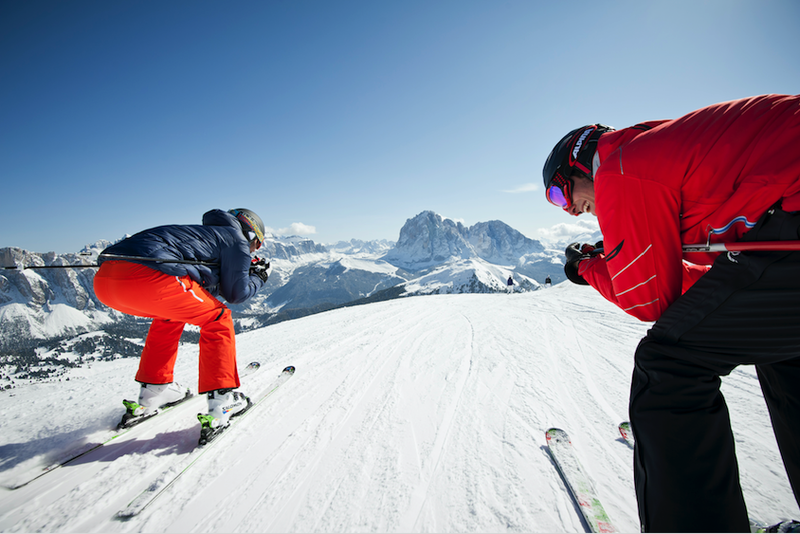 The culinary season with A taste for skiing on the slopes of Alta Badia officially starts on Sunday 10 December. For the sixth year of the much awaited Gourmet Skisafari, star rated cuisine will be brought to 2000m altitude as the star rated chefs of Alta Badia, together with their Italian colleagues who work in Italy or abroad, will delight skiers at some of the refuges, presenting the dishes that remind them of the flavours of their childhood, designed with a special eye on the culinary traditions of their land. For the Ski Carousel Vintage Party the region recreates the look and the feel of the ski area from decades past in the valley and up on the ski slopes. Participants dress and carry skis from the 1950’s to the 1990’s to create a fascinating vintage atmosphere and there are a series of themed events too. The Tourist Office Selva Val Gardena will organise the popular Rock the Dolomites winter music festival for the sixth time this season. Swing on Snow is a mix of traditional folk, jazz, soul, pop and classical music that’s not to be missed as musicians take over the huts on the Alpe di Siusi and the villages at the foot of the Sciliar for eight days.